Jess looks at the world from a scientific point of view. Maybe this is why she has no luck at love. Love is just a set of chemicals, basic biology. So Jess has put her love life on hold to concentrate on her career, which seems to working when she is handpicked to do some ground breaking research. Only when she arrives at the meeting point to go on the research expedition, something seems a bit off about the people she is going to research. Rafe has been a leader of his people, the T'kkr, for a long time. He wears his responsibility like a second skin. Lately, however, the pressure of trying to find the cure of their infertility has started to wear him down. Finding a planet that may serve to help them brings back a spark of hope. 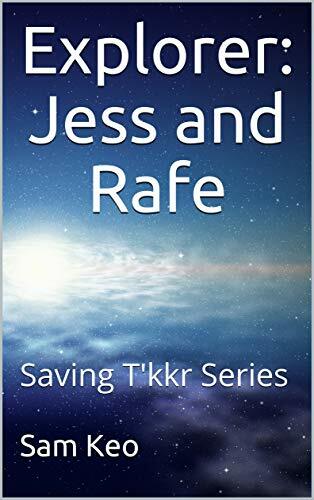 What Rafe doesn't expect is to feel a spark of attraction for one of the scientists that they have procured to help them. For that is what they have done. Under false pretences they are taking the Earth scientists to T'kkr. Hopefully the females will not be too fragile to help the T'kkr, as they are the last hope for the alien shifting nation. This story contains a feisty heroine who knows her own mind and a protective hero who just wants her. Add shifters, aliens and space travel for the perfect romantic adventure. Warning: This book contains sexual content which is only advisable for +18.